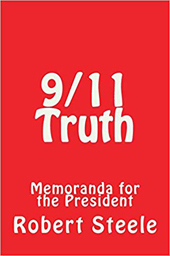 A group of 27 scholars have united in writing “Memoranda to the President” to demand Trump expose the truth of 9/11 this year. Will he respond? This compilation of writings is now available from the AFP Online Store (details below). “God Bless America and God Bless Donald Trump.” So begins a collection of memos to President Donald Trump by 27 experts on the attacks of Sept. 11, 2001. The presidential briefing on 9/11 was organized by Robert David Steele, a former CIA Clandestine Services Officer and founder of the Open Source Intelligence movement. Contributors include David Ray Griffin, widely considered the unofficial dean of 9/11 studies, Peter Dale Scott, the University of California-Berkeley professor emeritus who popularized the term “deep state,” Richard Gage of Architects and Engineers for 9/11 Truth, and two dozen others including yours truly. I’ve written a letter of transmittal to the president that focuses on what’s in the book and what he can do next. It’s about six pages long. I would say the chances of [President Trump] reading that memo are 80% or better. The chances of his getting a one-page summary are 95%. The chances of his actually getting the binder are probably down around 60%. The chances of his reading all the memos are in the 40% range. The bottom line is that Donald Trump knows this book has been published. He knows this book exists. He knows this book is calling him out on fulfilling his promise to get to the bottom of 9/11. And so I’ve presented him with something he cannot ignore as he goes toward his planned speech on the 11th of September this year. Though the mainstream fake news media constantly attacks Trump’s “conspiracy theories,” it never mentions the president’s most explosive campaign promise: Elect Trump and “you will find out who really knocked down the World Trade Center.” Donald Trump made that promise on Feb. 15, 2006 to a cheering crowd in Bluffton, S.C. Why isn’t the media holding Trump’s feet to the fire on this astounding promise—if only to further demonize him? Perhaps because the people who control the media are terrified that Trump might actually act on it? Or perhaps because they know how obvious it is that the World Trade Center was blown to kingdom come with high explosives, so they don’t want to draw attention to the issue? The media’s treasonous participation in the 9/11 cover-up underlines the truth of Trump’s charge that mainstream newspapers and TV channels are purveyors of fake news. The MSM’s false and libelous claim that radical Muslims were responsible for 9/11, when, in fact, the deed was done by Israeli agents and their treasonous American accomplices, is the biggest fake news story ever concocted. The fake news 9/11 official story is a racist lie. It directly triggered the murder of 32 million Muslims worldwide, according to avoidable mortality expert Gideon Polya. The racist assault on the Muslim world, whose major beneficiary is Israel, has created a flood of tens of millions of refugees that has overwhelmed Turkey, Pakistan, and various European nations. Yet the murderous, racist, genocidal 9/11-lie-purveying MSM says its truthseeking critics are the racists. It should cast out the beam in its own eye before worrying about the mote in the other side’s. 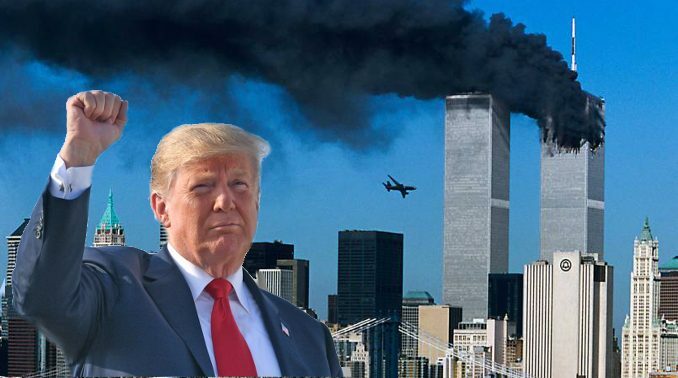 Trump could use 9/11 truth as a “nuclear option” to blow up the entire deep state and its lapdog media. But he would need the support of a dedicated core of patriots in the military and law enforcement communities. Whether that patriotic core has reached critical mass yet is an open question. Only $9.11! Order now from AFP’s Online Store. The contributors to Steele’s Memorandums for the President on 9/11 certainly hope that it has. Among them are ex-insider whistleblowers Tom-Scott Gordon, Susan Lindauer, and Scott Bennett. Bennett, a U.S. Army counter-terrorism officer working out of the Joint Interagency Operations Center at U.S. Central Command, was ordered to investigate Booz Allen Hamilton’s Terrorist Financing Operations Director, Rabbi Dov Zakheim—the comptroller of the Pentagon on 9/11, when $2.3 trillion went missing. What Bennett found implicates Zakheim and others in high treason. These and other 9/11 whistleblowers could help Trump finish off the deep state. Mr. President, are you listening?